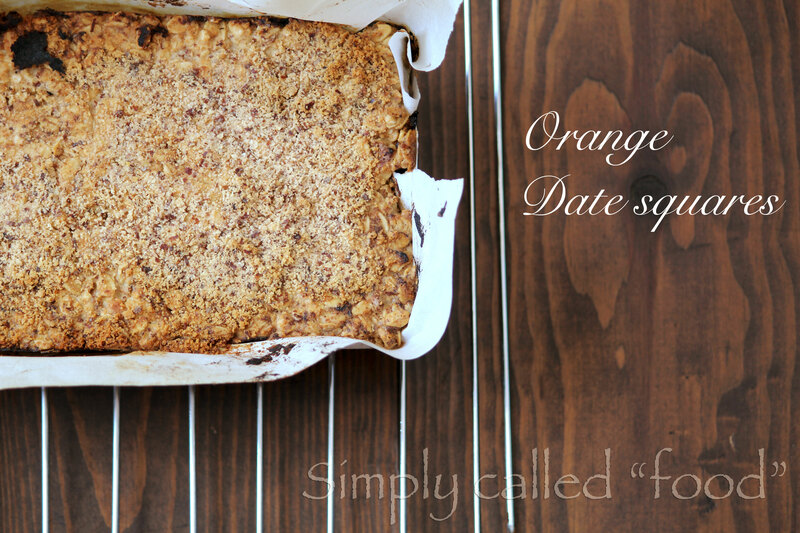 Orange date squares | Simply called "Food"
Today, my first intention was to redo my regular date squares recipe. We were going to ski in the afternoon and I wanted the kids to have a nice healthy snack after doing some outdoor sport with a nice hot chocolate. But it turned out a bit different when I decided to change a few ingredients, first by trying to find an alternative to the sugar I usually put in. I also add lemon juice, so I decided to modify that part by orange. I just took one orange and squeezed the juice out and after I took some zest of the skin. Then I reviewed all the ingredients and finally I ended up with something a bit different but really tasty and flavourful. In a small pot, put the dates, the orange juice, the water and the zest and cook for about 5 minutes or until it turns into puree, then let it cool. In a small bowl, combine the oatmeal, the quinoa flakes, the millet flour, the almond flour, the tapioca starch, the walnuts and the baking powder. Take an 8″x4″ oven dish and line it with parchment paper, it is very sticky and can be hard to remove. Put half of the oatmeal mix at the bottom and press firmly to make it even. Put it in the oven for 55 minutes. When you take it out of the oven, let it cool for at least 2 hrs before you remove it from it’s dish otherwise it won’t hold and it will only be good to add to your cereals (still good but not what you want). Tags: Almond meal, Coconut oil, Dates, dessert, Food, Fruit and Vegetable, Gluten free, Holidays, Millet flour, No added sugar, Nuts, Oatmeal, Quinoa, Recipe, Snacks, Vegan, Vegetarian, Walnut. Bookmark the permalink. Thanks! I found it added a little touch to the dates and the zest in it is also very interesting. What a yummy recipe! 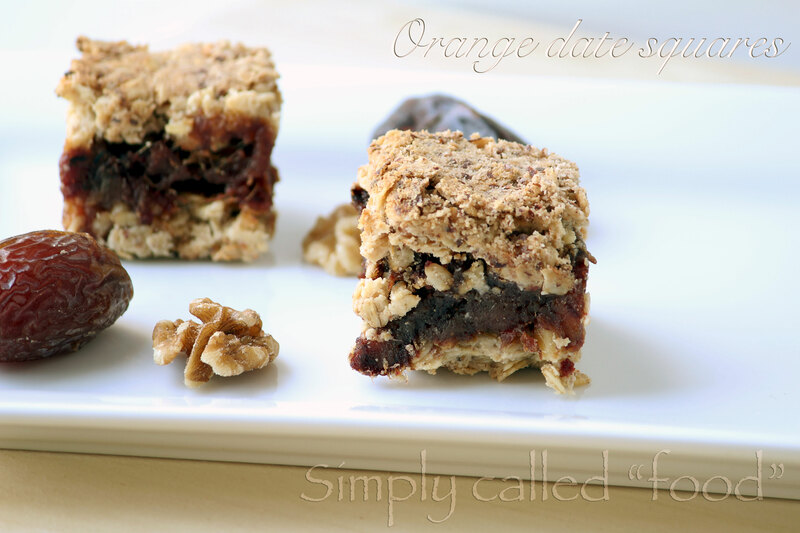 I am not sure I have ever had an orange date square??!! Sounds delicious though thanks! I never did either but it just came out in my mind while I was making it. It really tastes good! Thanks! This is so timely. I was just wondering what I should be doing with this bag of dates other than eat them straight out of the bag. Thank you for sharing! Thanks, it’s nice to know it can give ideas! Have a great day! great pictures , as always 🙂 and it looks delicious ! Thanks a lot! Have nice day!